While every constitution includes a provision over the right to equal protection of the laws, perhaps with different terminology, this book interprets this right in a new way. Theories of the right to equal protection of the laws as the right to anti-subordination are the most influential theories on the theory suggested by Drymiotou. 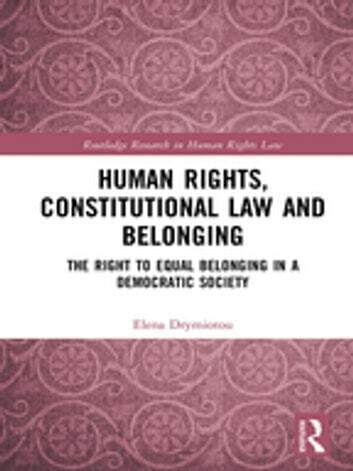 Elena Drymiotou suggests understanding the right to equal protection of the laws in terms of belonging. She goes on to identify certain criteria and she offers a general theory of the Right to Democratic Belonging. 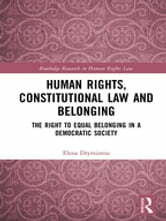 This book uses political theory, constitutional provisions and case law to suggest this new theory of the right to equal protection of the laws; the theory of the Right to Equal Belonging in a Democratic Society or in other words, the Right to Democratic Belonging. Human Rights and Equal Belonging in a Democratic Society is the starting point of a more comprehensive theory of the right to democratic belonging. It will be of interest both to students at an advanced level, academics and reflective practitioners. It addresses the topics with regard to human rights and equality and will be of interest to researchers, academics, policymakers and students in the fields of human rights law, constitutional law and legal theory.